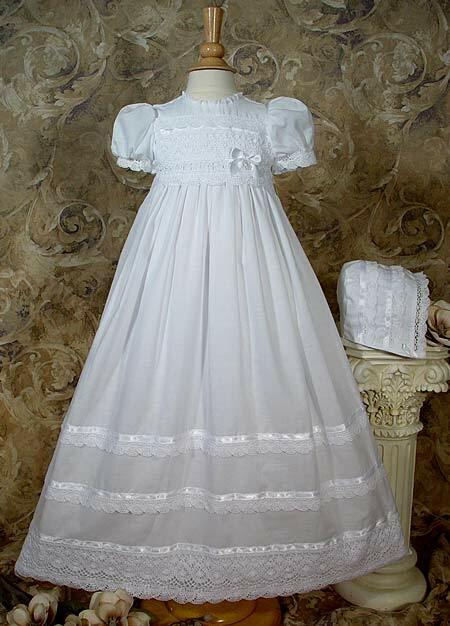 Beautiful 30" Short sleeve gown trimmed with intricate cluny laces and ribbon. Skirt has triple tier of lace and ribbon trim. (Note: 18 month size is 25.5" long, 24 month size is 27"). 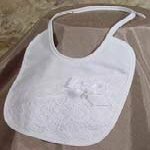 Includes matching bonnet and separate slip. 100% Cotton Batiste. Hand Made in the U.S.A. Hand wash. Shipped with elegant padded hanger and zippered vinyl bag. Heirloom Preservation Bag recommended for long term storage. Cotton Batiste Blanket W/Wide Cluny Lace Edge.